I’ve never met her. I know her only by the first name she uses in her e-mails. She was the one who clued me in that my readers might actually be afraid of letting the insurance company know that they had consulted with a lawyer, let alone hired one. I made that the subject of one of my previous columns. The fact that she still seems to be afraid to share her last name with me emphasizes the level of oppression car crash victims face, which continues to make my blood boil. I find her delightful for purely egotistical reasons. She gushes forth with appreciation for my columns, telling me that she finds my columns “right on” and informative. Affirmations that I am truly providing a service to some of the most vulnerable among us make my heart sing. She is reaching the end of the road with the insurance company. The adjuster wants to settle her claim. After being shown what she hoped was genuine understanding, empathy and assistance, she is starting to hear the “coolly inserted tone” that “rang like steel” into her mind. It is not important to me to get her business. Frankly, I have a larger clientele than I would like at the moment. What excites me is the prospect that these columns may lead this lady, and others, to insist on fair compensation for their injuries, whomever they choose to work with. She has twice made a specific request for a column topic. It’s about time I indulge her. This lady happens to be a senior citizen. I’ve commented about the hardships a car crash has on families with incomes. 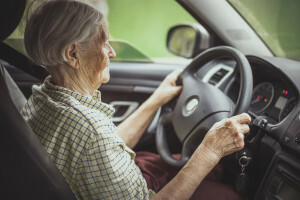 This lady is helping me recognize the very unique impacts car crashes have on seniors. If my car is written off, and my collision insurance comes up $2-3,000.00 short from my being able to replace it with an equivalent vehicle, I am able to make up the difference over time, perhaps by putting in some extra hours at the office. Seniors on a fixed income cannot make up the difference. Quoting from this lady, “They have to cash in carefully planned retirement funds, monies that they saved when they worked & which is very carefully allocated year to year”. If I face spending $100.00 per week for physiotherapy and chiropractic treatments, I can throw that on my line of credit and hope to make a little extra money next year or the year after so as to pay it off. If you are on a fixed income, you cannot do that. Typically, you have lived your life frugally, carefully putting away the money that you thought would be sufficient to last out your retirement. You have grown accustom to a normal, simple way of life, based on your financial means. An extra $100.00 per week throws that equilibrium out of whack. That’s just the financial bit. The one thing you hold up as a priority above everything else is your health. You are careful about hurting yourself, avoiding dangerous situations such as icy sidewalks and uneven ground as much as possible. These are supposed to be the years that you kick back and enjoy life. You are not going to jeopardize that by being careless. Unfortunately, no matter how careful you might be, you cannot protect yourself completely against bad drivers. You are more susceptible to chronic injuries from a crash. In her words, seniors “heal more slowly and they worry much more….not many years left when you are in the back side of life, and that time is supposed to be relaxing – but not if you’re an ICBC victim”. To top it all off, your insurance adjuster might be like this lady’s insurance adjuster, who suggested that her pain is not worth as much compensation as the pain suffered by a younger crash victim, because like most other seniors she has pre-existing conditions. Your adjuster might also suggest that your loss is worth less because you are not going to live as long! That is bunk, by the way. Let me know if you’re in the same boat that this lady has found herself. With your permission, I’ll forward your e-mail to her. Perhaps some mutual support might do you both some good.